Our August Nomad Income Report shows a nice rebound from our July drawdown. We spent the month in Zagreb and lived like locals. No big trips or crazy adventures, just exploring the city a bit and meeting up with other nomad families. Months like these help us stay grounded and feel normal. After all, this isn’t a vacation or a bucket list trip. So here it is, our August Nomad Income Report. $2,393.94 in realized gains for August, which is a decent rebound from last month. At 27.9% returns for the year, we have beat the market by almost 600%. Not bad, but this is still behind my goal of 1% returns per week (or 43% year-to-date). Similar to previous months, August’s gains came exclusively from Gold ETFs. I held a sizable short position in Amazon, but I missed my initial price target by not setting a limit sell order and held onto it into August. Having traded primarily gold over the year, trading stocks along side of gold was not only distracting, but it also limited our gains. When I’m trading gold, I’m tracking key economic events like non-farm payrolls or statements from grandma Yellen (Federal Reserve Chair) and following news that can have an impact on gold. Trading stocks adds a new layer of events and news to follow and in many cases I find it boring. If you trade gold, you follow geopolitical developments, world events, etc. When you follow a stock, you read news about share buy-back programs, product advances/faults of competitors and new product launches. The latter just isn’t my cup of tea, I guess. The volatility of gold, and especially the leveraged ETFs, provides a wide enough spread each week to swing trade. Swing trading is entering a position for between 2 days and 2 weeks, which differs from day trading, in which you enter and exit a position within the same day. Stocks generally have lower volatility than the leveraged ETFs, and positions may require weeks or months to move to a given price target. The day of this writing is a good example of a situation in which holding a position in a stock longer would have limited gains. Yesterday, I decided to cover my short on Amazon at a loss. Today, Amazon dropped 0.51% and had I not covered the short I would have gained $102. However, I invested the funds from the short in a leveraged ETF that was betting against gold going down and realized $670 for the day. Overall, I’m happy with the way trading has been going and now I’m in the strange but fortunate, position of deciding if this will become my life pursuit. Mark Cook, a well known trader of 26 years, says in his seminars that trading is the best profession out there because it offers three freedoms – financial freedom (infinite earnings potential), boss-freedom, and location freedom. Given our nomadic lifestyle and my 14 years of trading experience, consolidating some of our projects and focusing on leveling up my trading seems like a no-brainer. Writing: $0 – Sarah’s is getting her submission pipeline back up and running after being out of commission for three weeks. One of her stories titled “Please Do Not Delay” was published on Necessary Fiction. This was one of my favorites of hers! I’ve always preferred Sarah’s gritty, almost Charles Bukowski style, pieces. So, we’re still in the red for August given our trading income and higher than anticipated expenses. However, our business income is starting to pick up and when added to the income shared publicly, we’re in the black. This is a big milestone for us! When we set out, our strategy included three income streams – trading (short-term and highly volatility), private label and nomadica (medium-term and low volatility) and property (long-term and stable). Having tested our short and medium-term income strategies, we’re feeling more confident in our ability to sustain the lifestyle we’ve chosen. Again, we’re waiting a year to decide whether we’ll share our business financials publicly. In August, I started sending a newsletter to Nomadica subscribers. The newsletter features further updates from Sarah and I, sometimes a product that we recommend for making travel easier, and clever travel hacks we’ve learned along the way. We restocked some categories in our store and sales on our fair trade scarves have started to pick up as we’re going into fall. Our business expenses were minimal in August. If our August Nomad Income report was your first layover with us, you may want to check out our other Income Reports. Thanks again for being so open with your income and expenditures. As we struggle to get our heads above water preparing for our own adventure, it’s nice to see some concrete information. Quick question, you mention $649 for a month in a nice apartment. Would you be willing to share how you found this apartment? Airbnb? Wimdu? Local paper? Other? Hey guys! We found this apartment on Airbnb and before we booked, we messaged the host to negotiate a price. It’s usually best to negotiate a price, then book a few days via Airbnb and pay the rest in cash. This secures the place for a few days upon arrival and saves you both (host and guest) the Airbnb fees on the longer-term stay. Airbnb has a built in monthly discount but sometimes a host will go lower, especially if they don’t have the Airbnb fees. Thanks so much for the response. Priceless info. I also thoroughly enjoy these posts, the website and your transparency. Thank you so much for sharing everything with us. It really makes sense of things to us native land livers. 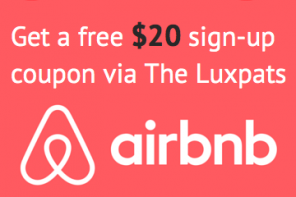 Nice hack with the Air bnb negotiation as well. Hey! Thanks for letting us know. We should have our November Income Report up in a couple of days. 🙂 Cheers!